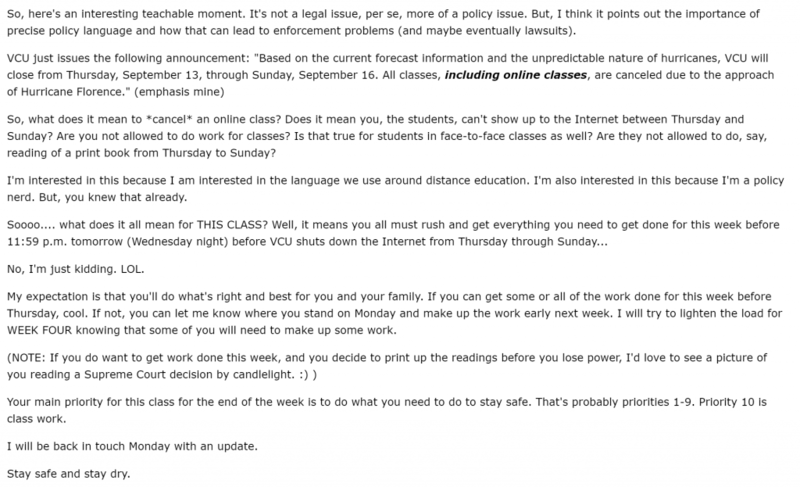 “Canceling” online classes – Jonathan D. Becker, J.D., Ph.D.
Based on the current forecast information and the unpredictable nature of hurricanes, VCU will close from Thursday, September 13, through Sunday, September 16. All classes, including online classes, are canceled due to the approach of Hurricane Florence. That’s the language used by my university in their alert about the cancellation of classes ahead of Hurricane Florence. A dramatic improvement in the forecast for our area notwithstanding, I am glad that the university took steps to make sure we can all be planful about safety and security. But, I still had a small problem with the alert. I am teaching an online class this semester, and I don’t know what it means to “cancel” an online class. In the end, this isn’t a huge deal; it’s not a hill I would die on. But, having spent a handful of years trying to help university leaders understand the importance of language around distance education and to try to understand how distance education is qualitatively different, let me try to explain my complaint. Let’s start with a different scenario. Imagine you are a student in a class that meets Tuesdays and Thursdays for 90 minutes each time. Per this alert, you will now not show up to the assigned physical classroom on Thursday. The instructor of the course has a few options, and most will probably just back things up and whatever was due Thursday will now be due on Tuesday. But, this means rejiggering the whole curriculum and syllabus as this effectively cuts 5 days out of the semester. But, what if the instructor contacts students and says that on Tuesday, the instructor will work to cover Thursday’s and Tuesday’s material on Tuesday? Is the student not supposed to do any work on Tuesday’s material until Monday? Are we to expect students to stop doing academic work from Thursday through Sunday? If not, what does it then mean to “cancel” an online class? I fully recognize that we are talking about a MAJOR storm here. “It will be tremendously big and tremendously wet” (Trump, D.J., 2018). And, as instructors, first and foremost, our concern should be for the safety of our students. Believe me, I get it. And I know that, among other things, there is (or was when the alert went out) a chance that students would be without power for some amount of time. And I know that if the university closes, that means that our 24/7 tech support would not be available to students. But, unlike the physical classrooms, students aren’t locked out of the Internet (or Blackboard). So, again, what does it mean to “cancel” an online class? Notice that it says “Online” under “Location.” A few years ago, the system indicated that the location for online classes was “Blackboard.” This may seem like an insignificant policy change in the grand scheme of policies in higher education. But, to me, this was a significant victory1. We were trying hard to encourage faculty to think broadly about the Internet and what it means for teaching and learning. At the very least, we wanted faculty to consider that Blackboard didn’t have to be the default platform for online or blended learning. Ultimately, this wording change in the system was largely symbolic, but our hope was that it was a signal to faculty and administrators. Words matter. So, when we use forms of the word “cancel” in relation to online learning, what does that signal? What does it mean? Here’s the text of the email I sent to my students. I think this is a fair approach; I think it’s sufficiently caring and that I have appropriately accommodated my students.